The super popular Aerotech Arreauxbee-Hi Kit and a Complete Aerotech 24/60 Motor with with a 29mm to 24mm Aerotech Motor Mount Adapter for only $89! Limit 1 per Person. MSRP is $167.97 ($99.99 Arreauxbee-Hi Kit + $64.99 24/60 hardware + $2.99 adapter). Save over 50% and - YES - the Hardware and Reloads are IN STOCK! 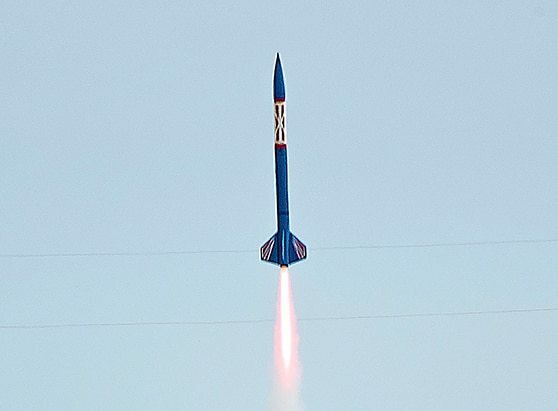 The AeroTech Arreauxbee-Hi kit pays homage to the beginnings of the model rocketry hobby by recalling the first mass-produced model rocket kit, the Aerobee-Hi. Manufactured in 1958 by Model Missiles, Inc., the Aerobee-Hi model brought the hobby industry into the space age. But don’t let this trip down memory lane fool you. There is nothing old-fashioned about the AeroTech Arreauxbee-Hi. At 4-1/2 feet tall and more than two-and-a-half inches in diameter, the Arreauxbee-Hi incorporates all the advanced design and engineering features that AeroTech kits are known for. Tools, construction, and finishing supplies sold separately. In order to launch, a launch system, model rocket motors, igniters and are also required.